Few colors personify elegance and royalty like purple and its many brilliant shades. It has been the color of choice for emperors across different eras and even in modern times, its brilliant hue retains this air of majestic flair. 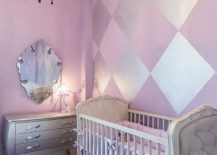 Add to it the fact that most experts feel this is the color that is best suited for nurseries as it combines a sense of opulence and excitement with calming ambiance and your job of designing that dream nursery suddenly seems a lot simpler. 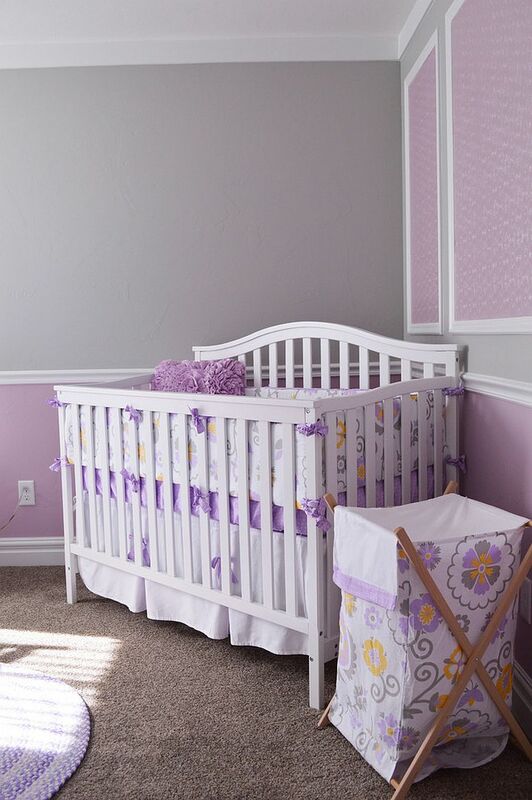 Exquisite, versatile and enchanting purple is that perfect building block for every awesome nursery. 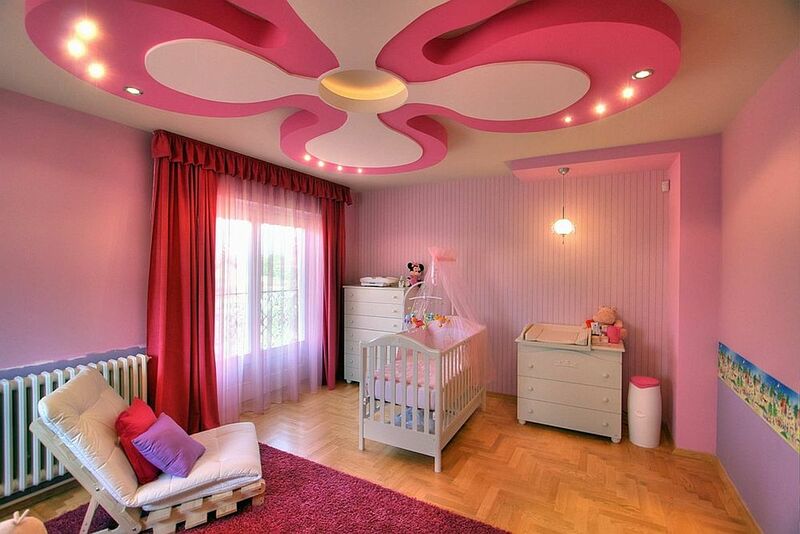 Picking a color scheme and a decorating style for the nursery is purely a personal choice. 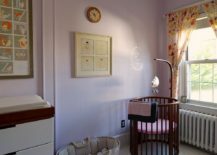 What works for one might not for others and while some might want extravagant themes and striking motifs, a gender-neutral nursery that can double as home office might be the way to go for others. Purple is a color that works surprisingly well with almost any approach you take as its many shades offer you everything ranging from the subtle to the spectacular. While darker shades of purple like red-violet and royal purple are best used in moderation, its lighter shades can create a cozy and uber-cute backdrop. 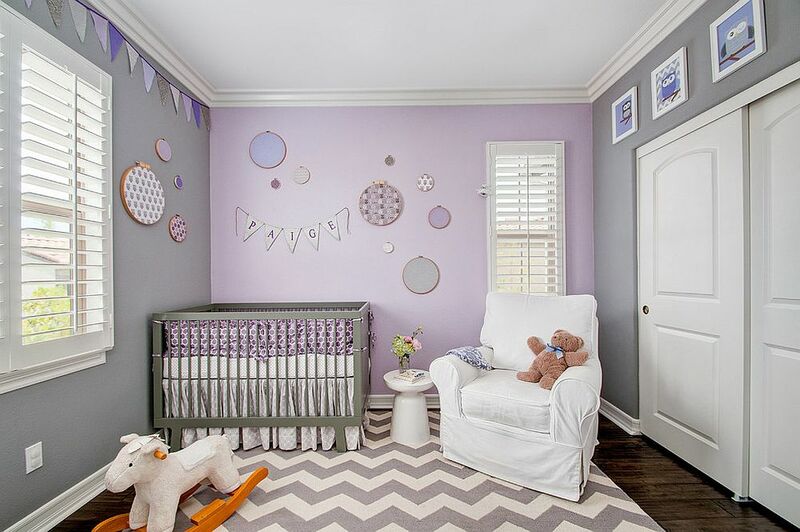 A nursery with its walls clad in light purple, Mauve, lilac or even thistle can replace the often used grays to shape a more exciting and colorful space without being far too overwhelming. This gives the room a fabulous ‘glow’ that simply cannot be achieved by using mere neutrals and yet the background looks unassuming and understated. 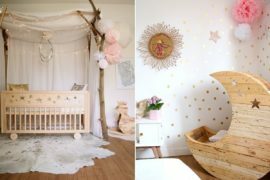 With such a smart canvas in place, you can start planning for the specific décor pieces such as the changing table, crib, a rocking chair or two, ottoman or any other thing you need, which will end up defining the style of the room. 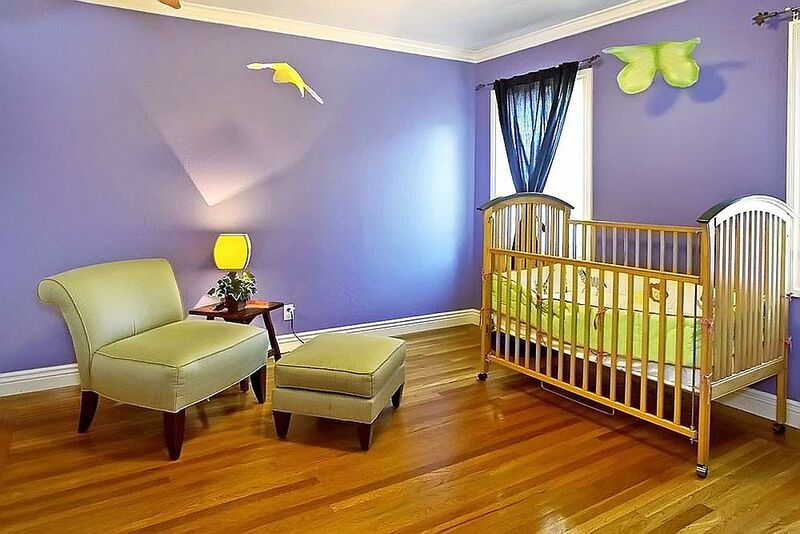 There are plenty of ways in which you can bring the purple walls alive without filling them with kid-themed murals and elaborate paintings. A lineup of 3D butterflies looks both playful and sophisticated and it adds another fun dimension to the room. If that does not work for you, then maybe the striped accent wall is the one you are after! 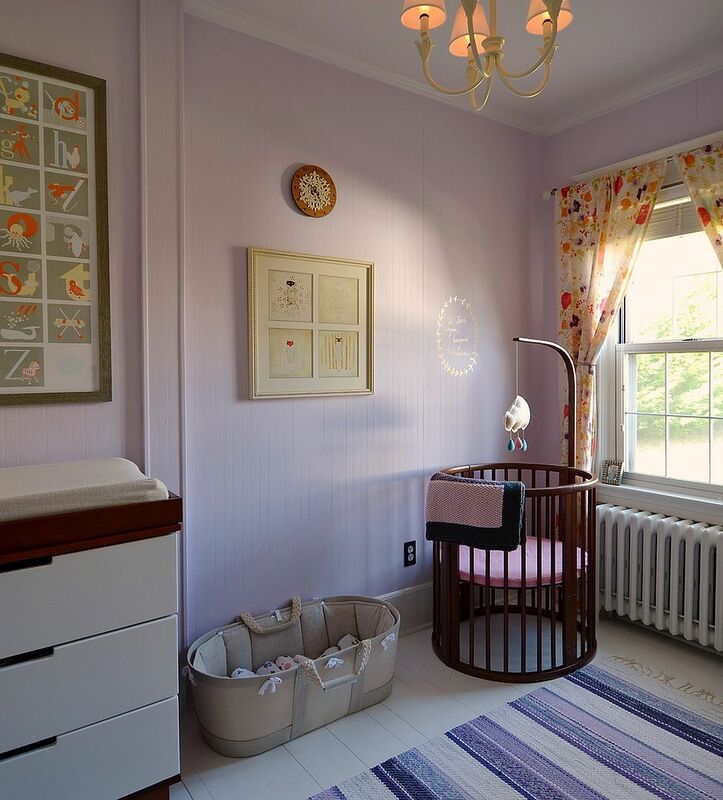 Using simple alternating lighter and dark tones of purple one can create a dashing and stylish nursery. 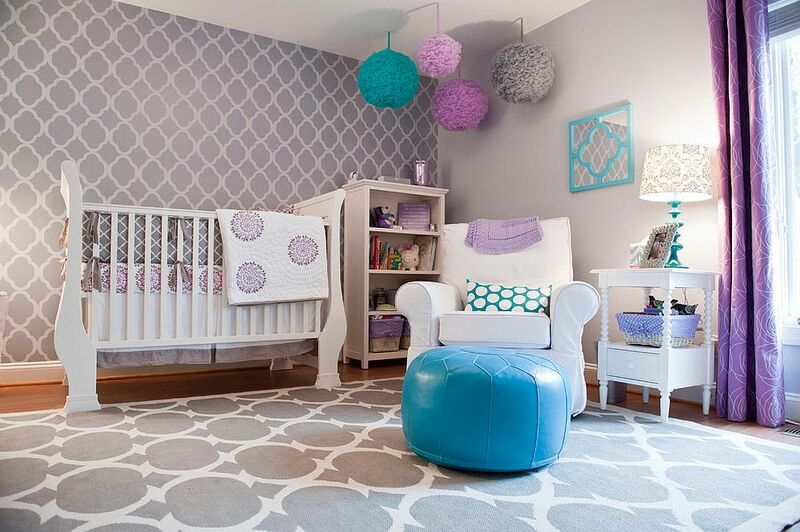 Custom geometric patterns on the wall are a hot trend that will look great in a nursery and you will not have to repaint the room any time soon as this is a style that will feel great even in kid and teen room. 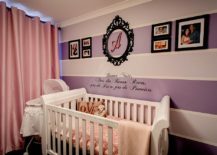 Finally, there is the option of custom wall murals and amazing ceiling designs for those who really want to take things up a notch and are willing to go the extra mile for a splendid nursery. 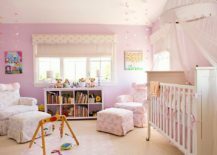 As much as choosing décor that grows with your child is a smart option, so is picking a color scheme that will easily adapt to the kid’s ever-changing taste. 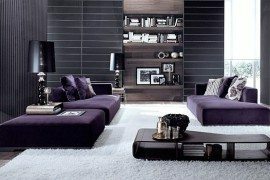 Purple does pretty admirably in this regard and it can blend in with a wide variety of themes as well. From traditional and Scandinavian to contemporary and minimal, purple seemingly finds a way to work everywhere! 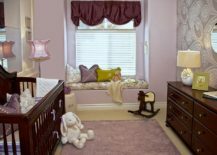 Even if it is not the central hue of the nursery, a striking purple rug or drapes in purple with bold pattern can make a big difference without forcing you to splurge on a complete makeover. 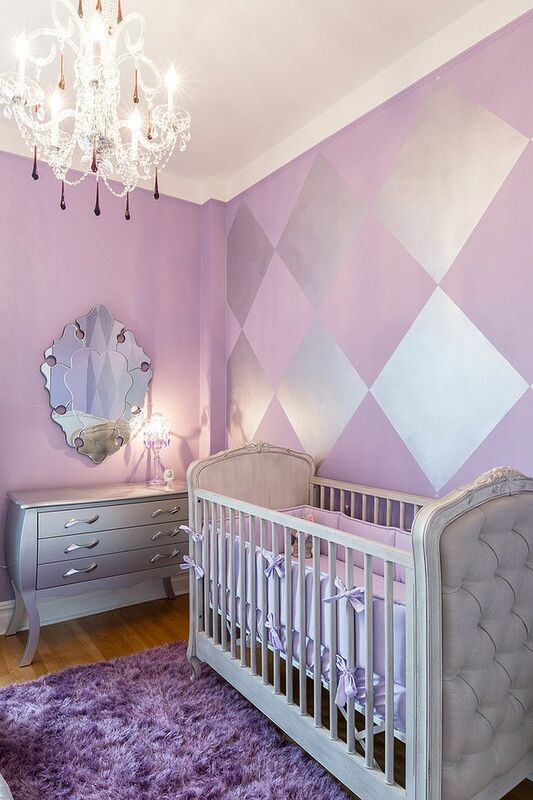 No matter which way you look at it, purple is definitely a hit in the modern nursery.